This traditional styled upholstered dining arm chair would be a wonderful addition to your dining room décor. 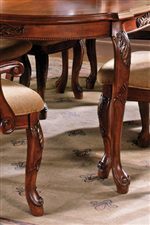 It features striking detailed carvings on the legs and exquisite flared back legs. Pair this piece off with the dining table from this collection for a complete and wonderful set. The Harmony Traditional Upholstered Seat Dining Arm Chair by Steve Silver at Walker's Furniture in the Spokane, Kennewick, Tri-Cities, Wenatchee, Coeur D’Alene, Yakima, Walla Walla, Umatilla, Moses Lake area. Product availability may vary. Contact us for the most current availability on this product. 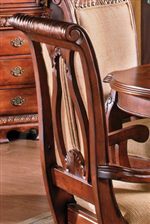 The Harmony collection is a great option if you are looking for Traditional furniture in the Spokane, Kennewick, Tri-Cities, Wenatchee, Coeur D’Alene, Yakima, Walla Walla, Umatilla, Moses Lake area. 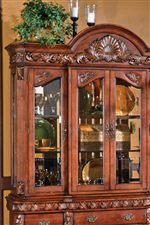 Browse other items in the Harmony collection from Walker's Furniture in the Spokane, Kennewick, Tri-Cities, Wenatchee, Coeur D’Alene, Yakima, Walla Walla, Umatilla, Moses Lake area.